A US military truck overturned on a road in western Poland, spilling shells for M-1 Abrams battle tanks, local media reports, citing military officials, adding that 2 American soldiers were injured. The incident took place on National Road 27 near the village of Piaski in western Lubuskie province on Saturday. “Preliminary findings show that the driver lost control of his vehicle and went off the road... The truck spilled tank shells,” Sgt. Kamila Wydrych from Municipal Police Headquarters in Zielona Gora, Lubuskie Province, said, as cited by Kontakt24 online news outlet. The shells are used for the M-1 Abrams, an American third-generation main battle tank, according to the spokesman for the defense ministry, Bartholomew Misiewicz, as cited by Polish media. Two soldiers (a driver and a passenger) received minor injuries in the incident, Dariusz Szymura, spokesman for the State Fire Service, told TVN24 news. One of them was treated at the scene, the other was taken to the hospital. The road was closed for 23 hours, after which traffic returned to normal. Road 27 passes the town of Zagan in western Poland, where hundreds of troops and equipment of the US military are currently stationed. This is not the first accident involving US military in Poland this week. 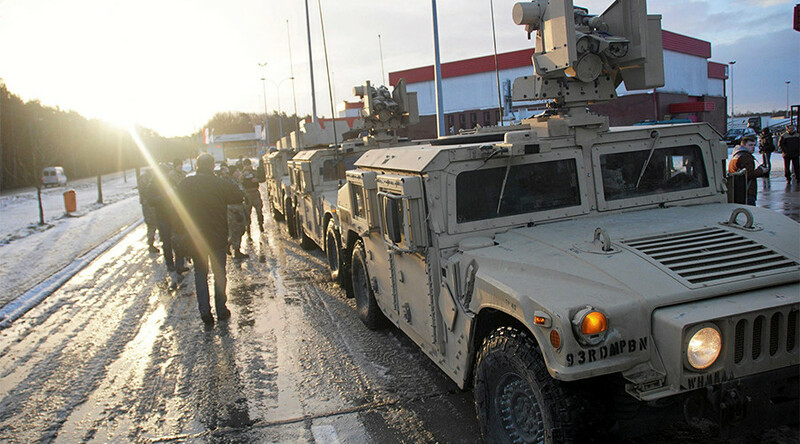 On Thursday, a US soldier was injured after two US Army vehicles driving in a convoy crashed into each other in southwestern Poland, the US Army said. It comes amid the arrival of US tanks and military equipment in eastern Europe for NATO military drills dubbed Operation Atlantic Resolve. NATO says the buildup along Russia’s borders is a defensive measure to counter the “Russian threat” amid the Ukrainian crisis. Russia has repeatedly called the bloc’s moves aggressive, while stressing that they are undermining security in Europe. In response, Moscow has been conducting large-scale military drills on its home soil and stationing its most modern weaponry and armaments on its western borders, including the exclave region of Kaliningrad, which lies between Poland and Lithuania.